Episode #255: Superman Comic Books Cover Dated October 1961: Superman #148 & Action Comics #281! Superman 148 & Action Comics 281! SUPERMAN 148, October 1961, was published on August 3, 1961. It contained 32 pages for the cover price of 10¢. Mort Weisinger was the editor, and the cover was pencilled by Curt Swan and inked by Stan Kaye. All three stories were reprinted in SHOWCASE PRESENTS: SUPERMAN vol. III. - THE 20TH CENTURY ACHILLES (9 pgs. ), written by Edmond Hamilton, pencilled by Curt Swan and inked by George Klein. - SUPERMAN OWES A BILLION DOLLARS (8 pgs. ), written by Robert Bernstein, pencilled by Curt Swan and inked by Sheldon Moldoff. - MR. MXYZPTLK'S SUPER MISCHIEF (8 pgs. ), featured on the cover, written by Jerry Siegel, pencilled by Curt Swan and inked by Sheldon Moldoff. This story was Jerry Siegel's 33rd silver age Superman story, and his 8th story overall for this era. Before this story he wrote two stories for ADVENTURE COMICS 288, September 1961: THE KNAVE FROM KRYPTON, drawn by George Papp, and BIZARRO'S SECRET IDENTITY, drawn by John Forte. ACTION COMICS 281, October 1961, was published around august 31, 1961. It contained 32 pages for the cover price of a dime. The editor was Mort Weisinger, and the cover was pencilled by Curt Swan and inked by Sheldon Moldoff. - The 12 page Superman story was titled THE MAN WHO SAVED KA;-EL'S LIFE, written by Robert Bernstein and drawn by Al Plastino. This story was reprinted in SHOWCASE PRESENTS: SUPERMAN vol. III. - The 12 page Supergirl story was titled THE SECRET OF THE TIME BARRIER, written by Jerry Siegel and drawn by Jim Mooney. This story was Siegel's 55th silver age Superman Family story, and his 88th overall. Previously, Siegel wrote two stories for SUPERMAN'S PAL JIMMY OLSEN 56, October 1961: THE SON OF JIMMY OLSEN (featured on the cover), drawn by Kurt Schaffenberger, and THE JINX OF METROPOLIS, drawn by John Forte. Elsewhere in DC Comics, 27 titles carried the October or October/November 1961 cover date, thanks to MIKE'S AMAZING WORLD OF DC COMICS. Next Episode: SUPERMAN FAMILY COMIC BOOK COVER DATED DECEMBER 1958: SUPERMAN'S PAL JIMMY OLSEN 33 & WORLD'S FINEST COMICS 98! In 2 Weeks: BOOK REVIEW: SUPERMAN BY LARRY TYE! Episode #254: Superman Family Comic Book Cover Dated November/December 1958: Superman's Girl Friend Lois Lane #5! 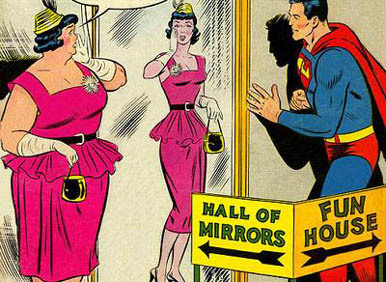 Superman's Girl Friend Lois Lane #5! SUPERMAN'S GIRL FRIEND LOIS LANE 5, November/December 1958, was published around September 11, 1958. All three stories have been reprinted in SHOWCASE PRESENTS: SUPERMAN FAMILY vol. II and SUPERMAN'S GIRL FRIEND LOIS LANE ARCHIVE vol. I. The editor was Mort Weisinger, and the cover was pencilled by Curt Swan and inked by Stan Kaye. - SUPERMAN'S GREATEST SACRIFICE (9 pgs. ), dcindexes.com does not list a writer, but comics.org identifies him as Robert Bernstein, but both websites identify the artist as classic Lois Lane artist Kurt Schaffenberger. This story was also reprinted in 80 PG. GIANT 3, September 1964, published around July 30, 1964. - THE GIRL OF 100 COSTUMES (8 pgs. ), was drawn by Al Plastino. - THE FATTEST GIRL IN METROPOLIS (8 pgs. ), written by Otto Binder and drawn by Kurt Schaffenberger. This story was also reprinted in GIANT SUPERMAN ANNUAL 1, covered in Episode 222. Since this episode only covers one comic book issue, also highlighted will be the other ads and features in this issue, including what might be the first letter page for Lois Lane, LETTERS TO LOIS. Elsewhere in DC Comics, 32 titles also carried the November or November/December 1958 cover date. They were covered in Episode 176, according to Mike's Amazing World Of DC Comics. 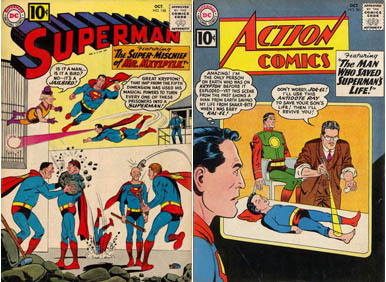 Next Episode: SUPERMAN COMIC BOOKS COVER DATED OCTOBER 1961: SUPERMAN 148 & ACTION COMICS 281! In 2 Weeks: SUPERMAN FAMILY COMIC BOOKS COVER DATED DECEMBER 1958: SUPERMAN'S PAL JIMMY OLSEN 33 & WORLD'S FINEST COMICS 98!